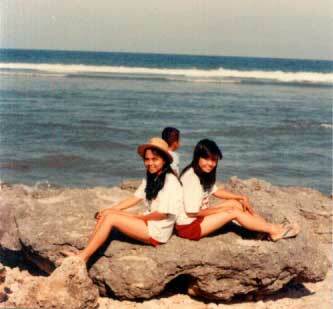 Bacnotan, La Union, Summer of 1990. For the first time in my college life, I was allowed to spend a week-vacation in the company of my female best friend E. She invited me to visit her parents and siblings whom she had not seen in years. It was a happy reunion between E and her family. The family members are innately quite people, but very accommodating so I easily get along with them. I really missed Bacnotan and I’ll probably visit the place when my best friend would invite me over again…Sadly, I haven’t seen E in two decades now. This entry was posted in Personal and tagged Bacnotan, hiking, La Union, rocky shores of Bacnotan, summer activities, swimming on May 2, 2011 by Yami. Being nostalgic? I love old photographs!